When I spoke at TEDx Winnipeg 2018 last year, I finished with a story about Bonnie. We’ve known each other for a lot of years. In the TEDx talk, I started the story by saying, “I can think of no better way to tell you about the beauty of the human forest that to tell you about…” how Bonnie showed up for my son, and helped him feel his feelings after the death of his mom. Recently it was my turn to show up for her when tragedy struck her life. Bonnie’s husband, Dan, died a week ago in the most agonizing of circumstances. Dan was in such pain he couldn’t see a way out, and he ended his life. She asked me to speak at his service. She wanted to use this time of remembering him to bring a powerful message to Dan’s community about connection, community and mental health. She is working to turn the desperate of the situation into something that might serve others–composting her heartbreak, something I admire in others and endeavour to work towards myself. I let Bonnie know that some people were asking for a copy of what I said. Bonnie is brave and kind and she gave permission for me to share this with the larger community. This is a hard day—very hard. Some of you almost didn’t come today—you contemplated not coming. The memorial service for a dear man in his prime, who has died in the midst of such tragic and painful circumstances, is almost too much to bear. There is so much wrong with why we are gathered here today—none of us would have wanted this to happen. However, you being here is something that is right about today. 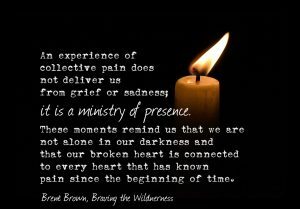 Your being here is part of the ministry of presence…of showing up for another, especially when it is hard. This is a devastating time. A time of feeling chaotic big emotions of love, longing, lostness, perhaps anger, discouragement, maybe betrayal, and maybe, most of all, deep and profound sadness. I honour your desire to remember Dan—the real and vibrant Dan—the son, husband and dad that he was, healthy together with you. Loving life, living big and enthusiastic— enjoying his sons, his wife, his life and his career. I have loved hearing stories and seeing the pictures of him living in full vibrant colour. You also bravely acknowledge the struggles that Dan had, and I honour your desire to bring meaning to this tragedy by choosing to use this as an opportunity to speak about the challenges of mental illness and the importance of actively working towards mental health. To help each other through the inevitable rough patches that are a part of everyone’s world that can get us all down. To somehow inspire those, that even today, right now, are experiencing their own internal darkness and have not spoken of it. And when you don’t reach out, you can’t know how very many people care. He knew how important it was to connect things together. Part of building something big and solid and useful for people was to join one piece of metal to another, one weld–one connection—at a time. He started his career creating a community of pieces of metal that would combine to become a structure that would serve humanity. He worked to create something beautiful and strong where nothing before existed. Dan knew about the value of strong bonds. As a therapist, I so firmly believe that we, as humans, are wired for connection, I spend my days helping people weld their lives to one another. We need each other— we were never meant do to life alone. We need strong bonds with others like we need food, water, and oxygen. A wealth of compelling research exists. Science has proven what we intuitively know: without others, there is suffering, always. Sometimes people are missing connections within themselves. They have pushed pieces of their pain or difficult stories so far down that they don’t walk through this world as whole people. Often they come to my office looking to figure out how to get rid of the suffering. And at the bottom of that suffering is generally a deep sense of loneliness—wanting to be loved, to belong. I work with people to understand the emotion that is often “that which shall not be named”. But I will name it: Shame. I name it as often as I can because things lose their power when you name them. Shame is that feeling or belief that we are somehow deeply flawed and not worthy of love and belonging. If you are capable of empathy you have that feeling. No one likes to talk about it, but the more we talk about it the less control it has over us. Shame comes in a variety of ways, but it’s basically the feeling of “I’m not enough.” We all have that feeling, and often spend a lifetime working through the implications of this lie. When mental health becomes an issue, that feeling becomes a runaway train. Though there is a deep need and desire to reach out, it is hijacked by a need to pull away and withdraw. Dan was magnificently created in the image of God. He was deeply and profoundly loved for who he was by God, and by so many in his circle. The struggles of his mind made it too hard to hold onto his inherent worth and value. Too often in this world that values strength, the appearance of endless competence, the need to put on a confident face at all times, there is precious little room to acknowledge struggle. Dan, indeed all of us, grew up in a world that expects men to put their heads down and work hard, to not let’em see you hurt. To not expose and explore the wounded parts that are a part of life. And when those wounded parts are ignored, they fester and grow, slowly taking over a life. And that, potentially combined with medical and or biological factors, leads to anxiety, depression and other forms of mental illness. And then, strugglers feel compelled to hide the struggle. Pulling away is what makes mental illness so nasty—because all illness is best treated in community. And so when one of the symptoms of the illness itself prevents the most important component of treatment—well, that’s when it starts to seem impossible. Later in his career, Dan moved beyond welding to inspecting welding. He understood that while connections were important…quality, solid connections welded together with excellence were even more important. 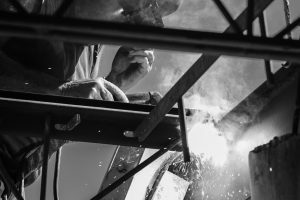 A connection that is welded together must be able to hold during the inevitable stresses that a weld has to endure is vital. He and his wife created a business, to ensure that the welds will have lasting strength. While welding is important, quality welding is essential. Connections are great…but meaningful, significant connections are what really matters. For metal, yes. But in human relationships too. So often , when we connect, we say, “How are you” with the expected answer of the other being: “Fine”. Even when they are struggling. That requires a special sort of courage…to invest in relationships with others where you can talk about the tender spots of life. A courage not often recognized and celebrated by our culture—specifically for men. We need deep and meaningful relationships; places where we can just show up and be loved, where we can belong and know that we matter. People numb that feeling of pain, that feeling of loneliness and unloveableness. Sometimes we take the edge off, and sometimes the pain leads to frantic numbing through too much shopping, food, or video games or alcohol. It stops being a couple of beers visiting with good friends, and gradually morphs into one beer after the other, alone, to numb the pain. We can’t selectively numb, however. When we numb the pain, we also numb the joy, love, creativity, and pleasure that life can offer. Johann Hari says the opposite of addiction is not sobriety. The opposite of addiction is connection. For Dan, as for so many, mental illness affected his connections…and when his connections were put under strain, it affected his mental health. Until one day, the pain was so very, very great that all the love of all the people who cared for him so very deeply got completely covered. Family and friends–he never stopped loving you. The love was always there. But the thick layer of pain caused by the mental illness covered that love so completely that he had trouble seeing it. He saw no other option to leave the pain—and now he leaves so many who cared so much about him. But let me be clear: this was NEVER about leaving you. When I went to lifeguarding classes, they told me that drowning people become dangerous. Very nice, very kind people who would give you the shirt off their back—when you plunk them in the middle of a lake without a life jacket and they panic? Well, if someone gets too close they can now hurt people in a way that is completely uncharacteristic of who they really are. Completely incompatible with who they are. A fantastic, loving person like Dan could hurt other people only out of the panic he had to not drown in his pain. The panic became so great he just could not use the help of those around him. Thank you for sharing your courage to reach out, and for your willingness to model that to the rest of us. I think it makes it just a teeny bit easier for others to ask for help when they know someone like you is reaching out. 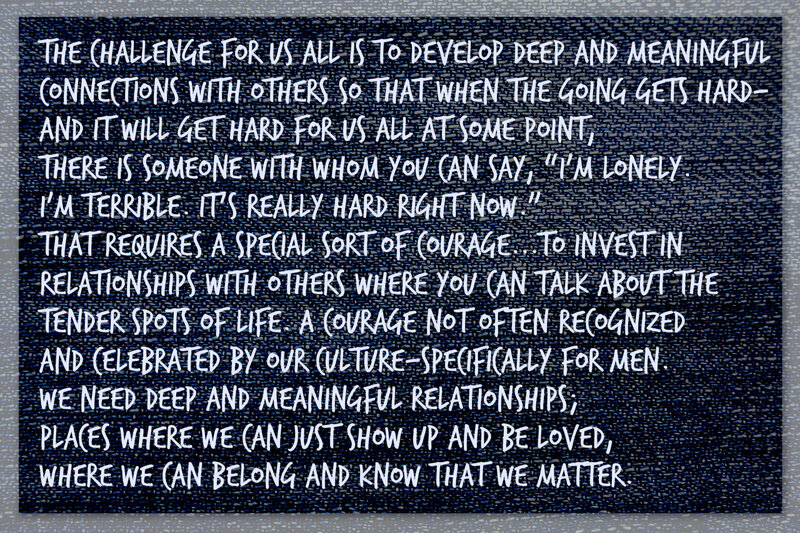 I’ve already acknowledged it is especially hard in our world for men to connect meaningfully—with other men, with mental health professionals—heck, sometimes even with their partners. I want to let the boys in their teens in this room know that I get it is especially hard for you. Where and how can teenage boys express sadness, the agony of loss? To the adolescent young men in the room: I don’t know if you know, but Bonnie will be forever my hero because she is the point person in my son’s life, to help him figure out how give himself permission to feel emotions, explore them, and hold space for the messiness of those feelings. It hasn’t been easy for my son to deal with the big feelings that are there, because his mom died, and I don’t think we could call him an expert at it just yet—are any of us experts at it? But Bonnie was and is a safe place for him to figure some of this stuff out. See if you can find even one person to talk to…now, or when you’re ready. One day, I was running on the treadmill at the Pan Am Pool overlooking swimming lessons. I saw a little boy fall off the little platform he was standing on in the shallow end—and he started to flail and struggle as he was literally drowning before my eyes. I was helpless up above to do anything given the thick glass between us. In what seemed like a long time, but was actually probably about 10-15 seconds, his teacher turned around and saw his struggle. But, rather than picking him up and putting him back on the platform for safety, she put her hands under his armpits to hold him right where he was. And then I could see him straighten his legs and his toes touched the bottom. When he wasn’t panicking, he could touch the bottom and be safe. But he didn’t know that until someone let him know, and held him gently while he figured it out. Friends and family…please be like that swimming teacher. In these days after Dan’s death, when others are tender, look around to see who looks like they are drowning. Reach out to care for each other. In real life, drowning people and regular people actually look a whole lot the same on the outside. It’s hard, maybe impossible to know who is in struggle. Be kind to everyone you meet–because we are all fighting battles to one degree or another. Your act of caring, your expression of thoughtfulness, your kind integrity can help someone, in the middle of a struggle, to straighten their knees to touch the bottom and become okay again. There is a story in the Bible where a man is paralyzed and can’t get to Jesus to ask for the healing he desires. His friends put him on a mat, haul him up some stairs onto a roof, and cut a hole in the roof so they can lower him down to Jesus. And Jesus gives him the healing. These guys are firmly welded to this paralyzed man, and they get a little ridiculous in their efforts get this guy an opportunity to be better. There’s humor and whimsy in the extremes they go to help a friend. God offers us healing—sometimes directly, but very often through the people He puts in our lives to be God’s presence. Dan is healed. He is at peace. He is no longer in pain. However, you are. Your pain is real and it matters. My prayer would be that you would allow others into your lives to be able to bear the pain that we all carry. 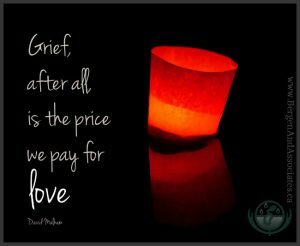 Grief is the price we all pay for love. And Dan loved you and you loved Dan. There is pain from D’s death and will continue to be in the weeks, months, even years ahead. May you continue his love of connections and celebrate that passion—by welding yourself meaningfully to others…to create structures able to carry the weight of your pain. May you gently reach out to the one beside you in this time to help weld a connection that will be healing for all. This is a long article but very powerful. It sure touched me as I have a child with a mental illness and suicidal ideation. I think one difference that stands out in particular is that when it’s a child you’re talking about you have to try to make those strong, meaningful connections for them as they simply just don’t have the tools at this young age. And making those connections is hard. You would think it would come naturally when you have loving people all around you, but just because somebody loves you and cares about you doesn’t mean there is a deep strong connection. I worry non-stop, I pray all the time, I sleep in her bed with her, or just outside her room. It’s an ongoing process. And I am very grateful for articles like this and to hear other people’s stories and to know that there is more and more discussions happening around the topic of mental illness. Beautiful, Carolyn…and I’m sorry for the loss of your friend.